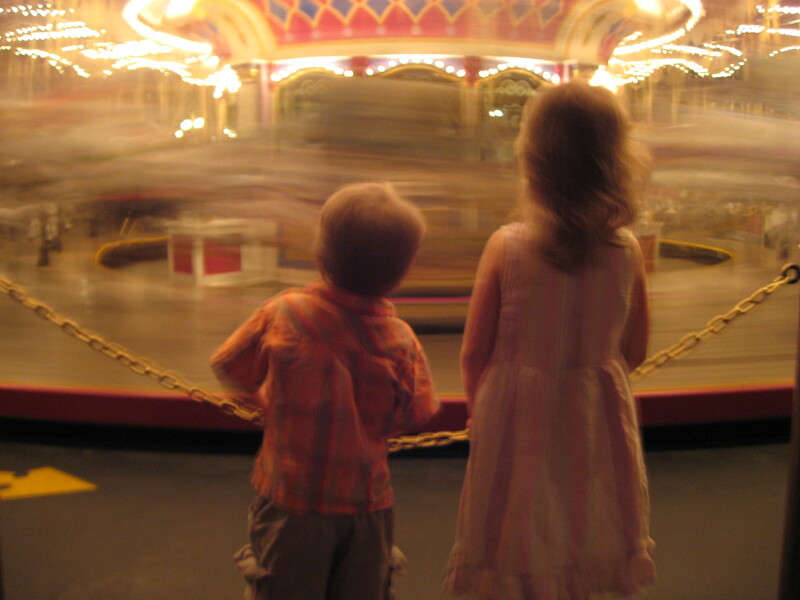 This is a pic I snapped of our kids watching and waiting for their turn on Cinderella's Golden Carousel. Late at night just before the fireworks started. While they won't remember it, this is one of the images I'll always remember of their childhood. We'll always remember when our daughter was asked for her first autograph. She was four and we were vacationing at Disney World. Our daughter was self-basting in a canary yellow polyester princess dress and matching bling that she insisted on wearing in the 30 degree weather. Our more sensibly dressed son was two and, unlike his parents, just couldn't get enough of the It's a Small World attraction. While hiking across the park for our third boat ride of the day, we were stopped by a cast member (Disney-speak for employee). The cast member knelt down, took an autograph book and pen out of her back pocket and asked if our princess would sign her name. "I'm not really a princess," my daughter confessed. "'Are you sure,' asked the cast member. 'You look like a princess and you act like one too.'" So my daughter scratched out her name with great attention to detail and then got showered in castle-shaped confetti. By the end of our vacation, our daughter was like a paparazzi-seeking, red carpet-seasoned starlet, giving autographs to any cast member who asked or passed by. Turns out that asking pint-sized guests for autographs is called a Take 5 at Disney — a five second show of customer appreciation. "Think of them as real-life versions of those random acts of kindness you read about on bumper stickers," says author and former Disney executive vice-president Lee Cockerell. "All those seconds and minutes repeated thousands of times a day add up to better customer relations than you could buy with a big corporate public relations budget." Making sure everyone matters and that everyone knows it. Breaking the mould. "Your job as a leader is to figure out what the organization should look like, not just to do your best within the existing design," says Cockerell. Make your people your brand. Learning the truth. "If you don't know the facts, how can you possibly make the best decisions." Burning the free fuel of appreciation, recognition and encouragement that drives employee engagement. Staying ahead of the pack by being a lifelong learner. Being careful what you say and do, because your employees are always watching and listening. Developing character. What do you stand for? What are your core values? Where do you draw your lines in the sand? Says Cockerell, who ran Disney's resort operations for more than a decade, these 10 common-sense strategies build strong leaders. Strong leaders get you happy and productive employees. And happy and productive employees get you happy and loyal customers, repeat business and invaluable word-of-mouth marketing. "In studying the guest satisfaction surveys at Walt Disney World, I've seen a clear trend," he says. "People who say they had a memorable interaction with a cast member invariably give an excellent rating, and they are also far more likely to return on their next vacation." Cockerell says Disney has a 70 per cent return rate among visitors and the lowest employee turnover of any major North American hospitality company in the industry. "The formula is simple," he says. "Committed, responsible, inspiring leaders create a culture of care, which leads to quality service, which leads to guest satisfaction, which leads to measurable business results and a strong competitive advantage." Leaders are expected to adhere to the Four Cast Expectations, Disney's version of the Golden Rule. Make me feel special. Treat me as an individual. Respect me. Make me knowledgeable. Disney has essentially the same set of expectations for how cast members should treat every guest. "Disney leadership trains cast members to fulfil these expectations by treating them the same way. Leaders do unto cast members the way they want cast members to do unto guests." It's a winning formula and why we'll be back in the Magic Kingdom this spring, waiting for another slow boat ride through It's a Small World and looking forward to those magical Take 5 moments. i did not know that disney offered things like this. thanks for the great information. What a great story. I can only imagine my daughter’s reaction if this were to happen to her. Thanks for this. I’ve being researching for holidays plan and reading your blog, I found your post very helpful 🙂 . I thought I would leave my first comment. I don’t know what to say except that I have enjoyed reading. Nice blog!